A great place to visit in Adelaide is the Adelaide Central Market which is located between Grote St and Gouger St. To get to the location of the Adelaide Central Market you can either get through the Market Arcade coming from Victoria Square or pass through Chinatown and the Market Plaza. 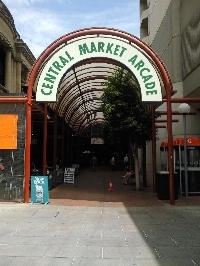 You can also approach the Central Market from either Grote or Gouger St where you will find two entrances of the market. At either sides you will find the Adelaide Central Market Map with all the information you need to find you favourite stands. The Adelaide Central Market Opening Hours: The market is open daily exept for Sunday and Monday. The opening hours are on Tuesdays from 7 am to 5.30 pm, on Wednesdays from 9 am to 5.30 pm, on Thursdays from 9 am to 5.30 pm, on Fridays from 7 am to 9 pm and on Saturdays from 7 am to 3 pm. You will find all kinds of products at the stands of the Adelaide Central Markets from fruit, vegetables, seafood, meat, poultry, nuts and bakeries to plants and flowers. There are also several cafes and eateries at the Central Markets and its a short stroll to the many restaurants and shops of adjacent Chinatown. Did you enjoy The Adelaide Central Market Opening Hours and have you been on a holiday in Adelaide, Australia?